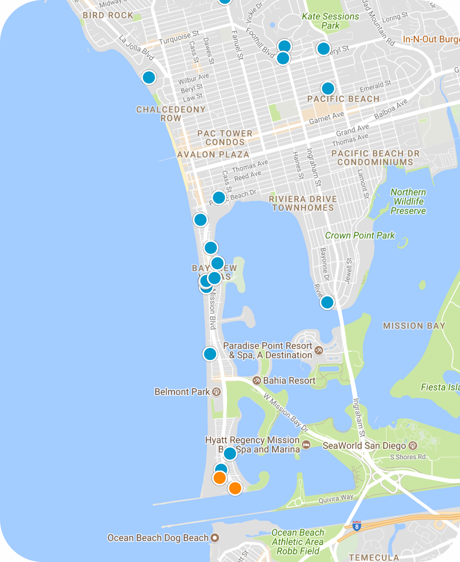 San Diego Home Sales website search offers all Mission Beach homes, condos and foreclosures for sale. You are able to get new property listings daily that meet your search criteria. Enjoying a unique location sandwiched between the Pacific Ocean and Mission Bay, Mission Beach is the center of The Strand, the most popular beach area in the City of San Diego, which extends from the Mission Bay jetty at the channel entrance to the northern end of Pacific Beach, adjacent to La Jolla. With 2 miles of oceanfront real estate on the west and sheltered sandy bay front on the east, Mission Beach is a popular vacation destination and is one of the premier locations for water sports of all types, including sailing, boating, skiing, rowing, kite boarding, wind surfing, swimming and surfing. Over The Line and beach volleyball are played year round. The boardwalk stretches 3 miles from South Mission to Pacific Beach. Some of the most entertaining people watching in San Diego is found along this stretch of sand as people walk, jog, skate and cycle here seemingly nonstop. The focal point of an area teeming with restaurants, stores, surf shops and beach rentals is Belmont Park and the beachfront roller coaster, The Big Dipper. Originally built in 1925, this 73-foot-tall wooden roller coaster closed down, survived a fire, was refurbished and the reopened in 1990. Also located at Belmont Park is the historic Plunge, offering indoor swimming, and The Wave House, a popular beachfront bar that features two wave riding machines.